Bronchiectasis is a lung condition in which the bronchial tubes of the airways become permanently widened and scarred. 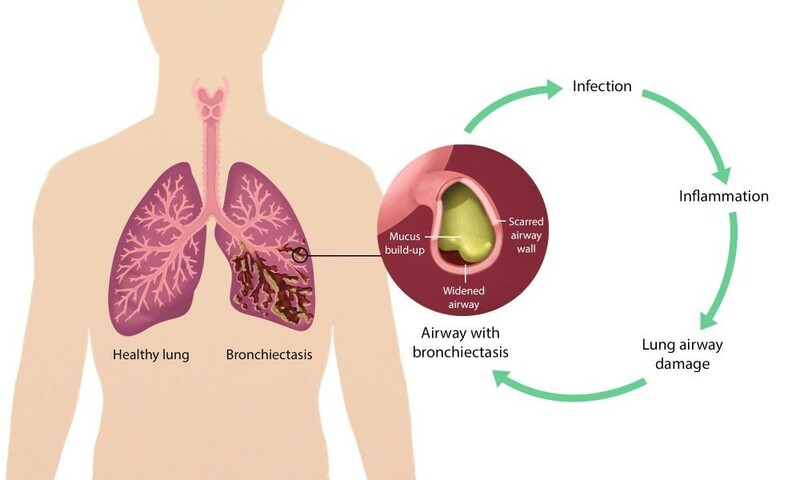 Bronchiectasis usually occurs as a result of inflammation caused by an infection or other condition that injures the walls of the airways, especially to the cilia. 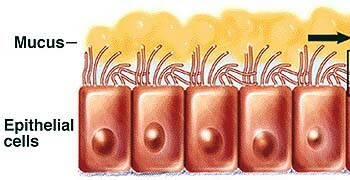 The cilia are the tiny hair-like structures lining the inside of the airways. Damage to the cilia prevents them from sweeping dirt and clearing mucus out of the lungs. The airways slowly lose their ability to clear the mucus out of the lungs. The accumulated mucus breeds the bacteria which leads to repeated and severe infections causing further damage to the bronchial tubes. As it progresses, “pockets” in the airway can be developed as a result of scarring and elastic tissue destruction which traps mucus and germs growing inside. This can eventually lead to lung damage and inability to get oxygen to the body’s tissues as well as respiratory failure. The most common symptoms of bronchiectasis include chronic coughing with a large amount of thick yellow or green sputum, shortness of breath, wheezing, and chest pain. 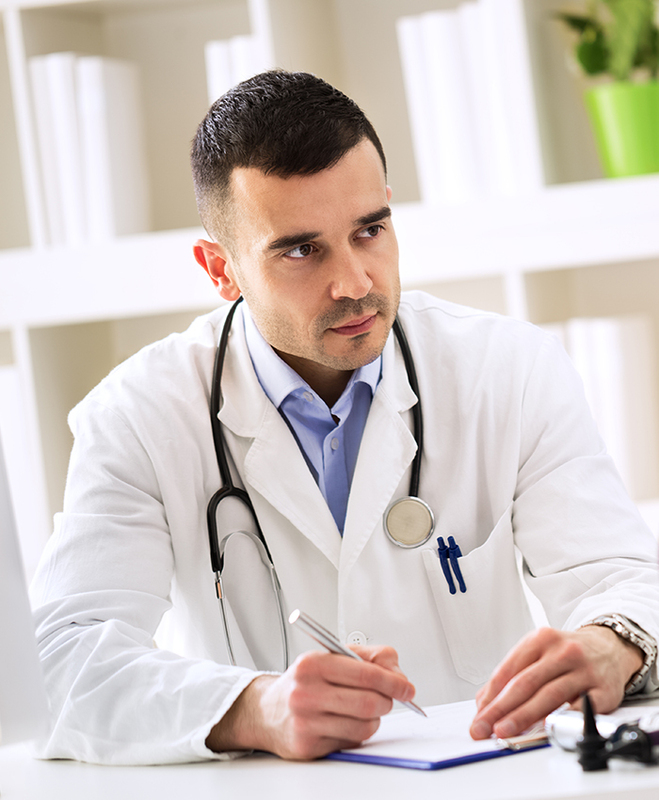 In more severe cases, symptoms such as excess fatigue and coughing up blood can occur. 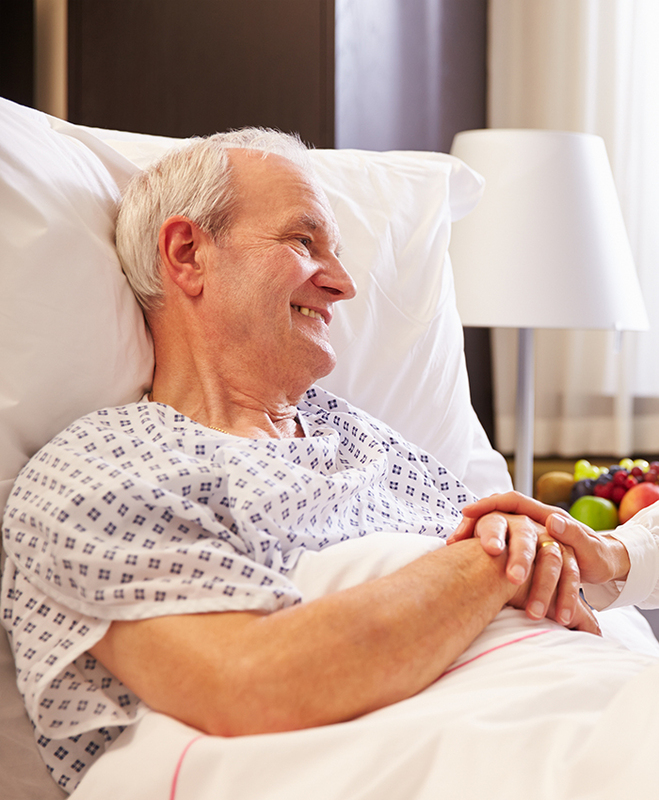 At the late stages of bronchiectasis complications such as respiratory failure or atelectasis can occur. Respiratory failure can cause rapid breathing, bluish color of the lips and skin, and confusion. Atelectasis is a condition in which one or more areas of the lungs collapse which causes increased heart and breathing rate. 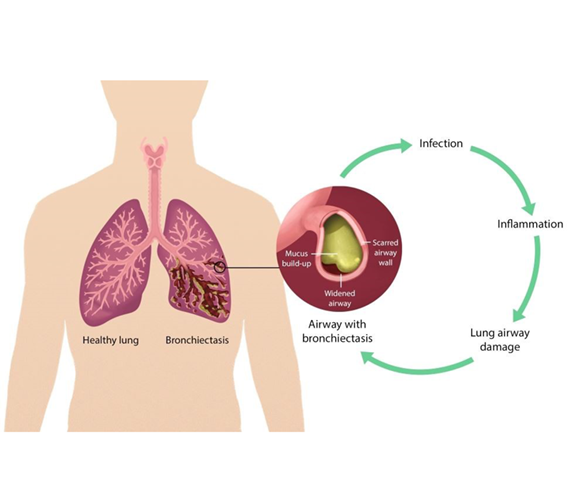 One cause of bronchiectasis involves lung infections such as pneumonia, whooping cough, tuberculosis, or lung fungal infections. 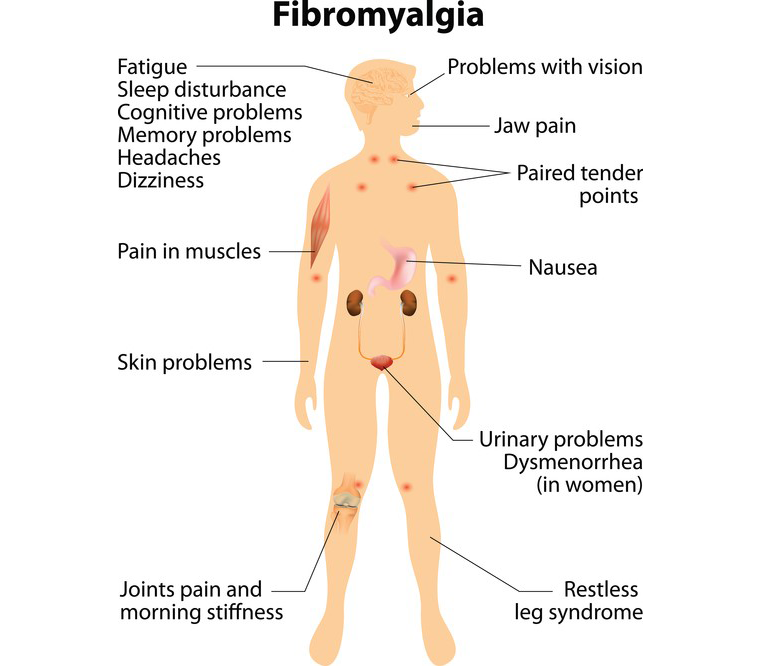 Other causes involve conditions that damage the airways as well as raise the risk of lung infections such as cystic fibrosis, immunodeficiency disorders, allergic bronchopulmonary aspergillus, primary ciliary dyskinesia, and connective tissues disease such as rheumatoid arthritis. Bronchiectasis is characterized by mild to moderate airflow obstruction that worsens over time. The condition often begins in childhood; however, symptoms may not occur until months or even years after the repeated lung infections begin. It is proposed that an insult typically from the environment impairs mucociliary clearance of mucus and foreign substance resulting in microbial colonization in the airway. 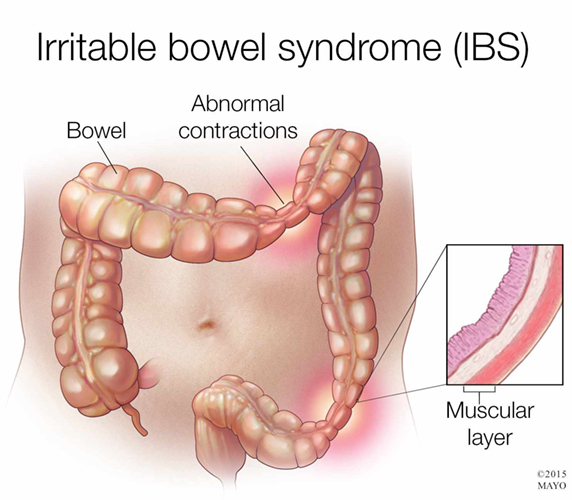 Microbial colonization leads to chronic infections causing inflammation. Chronic inflammation results in tissue damage to the cilia and further impair mucociliary motility. 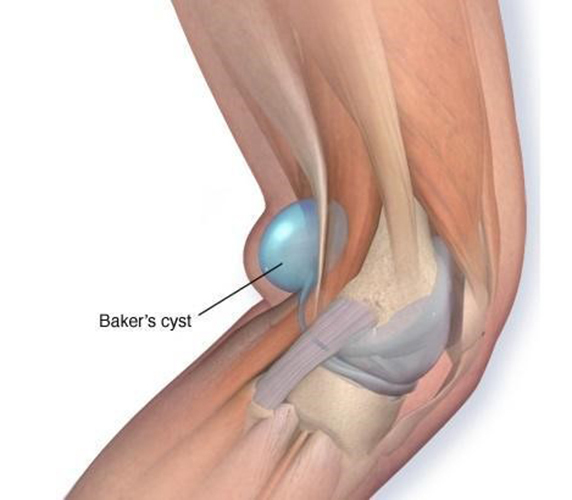 This process leads to a vicious cycle of repetitive infections with progressive inflammation and tissue damage. A variation in microbial flora within the lungs appears to change with the severity of the condition. The most common pathogenic bacteria discovered in bronchiectasis patients is haemophilus influenzae, a gram-negative anaerobic bacterium, and in patients at a more severe stage, pseudomonas aeruginosa which is also a gram-negative bacterium that can grow anaerobically or aerobically. Mediators released by these two types of pathogenic bacteria inhibit the process of mucociliary clearance. H. influenzae has the capacity to cause direct damage to airway epithelium and is also able to invade into the bronchial wall and interstitium of the lung. P. aeruginosa has the capacity to form biofilms which can advance the disease. The most comprehensive study done to discover the pathogenesis of this disease was performed by Whitwell and involved 200 operative lung specimens. This study showed inflammation of the bronchial walls, bronchial dilation characterized by a loss of elastin, and bronchial wall fibrosis. Whitwell demonstrated this progression seen in Figure 1. 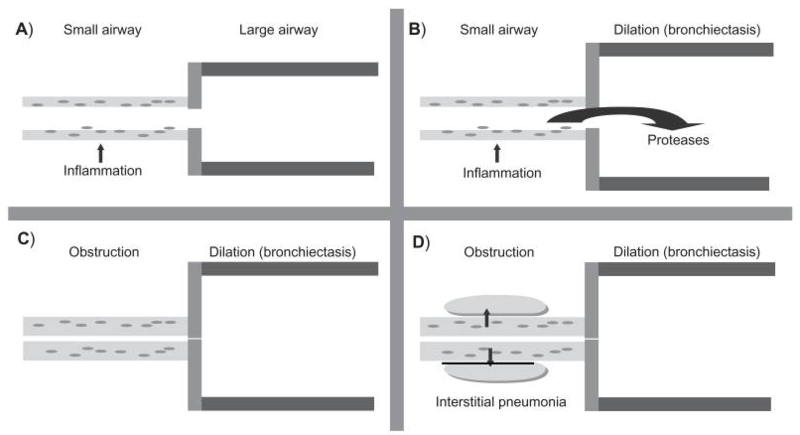 The first process (Figure 1 A) involves infection that leads to inflammation, followed by the release of pro-inflammatory mediators such as proteases which damage the airways causing bronchial dilation (Figure 1 B). The immune cells involved in the inflammatory process have been identified as neutrophils, lymphocytes, and macrophages. Neutrophils release mediators such as proteases and elastase which breakdown the elastin within the airways. The infection causes progressive inflammation of the small airways which become thicker from a combination of cell-mediated inflammatory infiltrate and lymphoid follicles resulting in an obstruction (Figure 1 C). Lymphoid follicles are small masses of tissue that contain aggregations of immune cells. Lastly, are the repeated infections that arise from the microbial colonization, noted as pneumonia, causing further infection and inflammation of the air sacs (Figure 1 D). Obstruction of airflow characterized in bronchiectasis patients is seen based on a measurement of forced expiratory volume in one second (FEV-1). A lung function study found that the airflow obstruction was predominately due to features of mucosal wall thickening and bronchitis in the small and medium airways of the lungs. The study done by Whitwell explained these findings by showing that the large airways predominately become dilated but the small and medium airways are characterized by thickening of the bronchial walls.